Antisemitism was found across the political divide in Russia’s year of revolution. Early morning, October 25, 1917. Workers are taking up strategic points on the windswept streets of Petrograd. In the Winter Palace, head of the Provisional Government Alexander Kerensky anxiously awaits his getaway car. Outside, Red Guards have taken control of the central telephone station. The Bolshevik seizure of power is immanent. The slogan retains its absurdity a century on: Kerensky, of course, was not Jewish, whereas Trotsky was. What the slogan does point to, however, is the messy and contradictory role that antisemitism played within the revolutionary process. In much of the existing literature on the Russian Revolution, antisemitism is understood as a form of “counterrevolution,” as the preserve of the anti-Bolshevik right. There is, of course, much truth to this claim: the tsarist regime was defined by its antisemitism, and in the devastating wave of anti-Jewish violence that followed the October Revolution in the civil war years (1918–1921), the bulk of the atrocities were carried out by the White Army and other forces opposed to the nascent Soviet government. Yet this is not the full story. Antisemitism traversed the political divide in revolutionary Russia, finding traction across all social groups and political loyalties. Within Marxism, racism and political radicalism are often framed in contestation; in 1917, however, antisemitism and class resentment could be overlapping, as well as competing worldviews. The February Revolution transformed Jewish life. Just days after the abdication of Tsar Nicholas II, all legal restrictions on Jews were lifted. More than 140 statutes, totaling some thousand pages, were removed overnight. To mark this historic moment of abolition, a special meeting was convened by the Petrograd Soviet. It was the eve of Passover, March 24, 1917. The Jewish delegate who addressed the meeting immediately made the connection: the February Revolution, he said, was comparable with the liberation of Jews from slavery in Egypt. Formal emancipation, however, was not accompanied by the disappearance of anti-Jewish violence. Antisemitism had deep roots in Russia, and its persistence in 1917 was closely connected to the ebb and flow of revolution. Over the course of 1917, at least 235 attacks on Jews were carried out. Though totaling a mere 4.5 percent of the population, Jews were victims of around a third of all acts of physical violence against national minorities that year. From the moment of the February Revolution, rumors of impending anti-Jewish pogroms circled on the streets of Russian cities, so much so, that when the Petrograd and Moscow soviets assembled for their first meetings, the question of antisemitism was high on the agenda. Actual outbreaks of violence were rare in those early weeks. By June, however, the Jewish press began to report that “crowds of workers” were gathering on street corners to welcome pogromist speeches that declared the Petrograd Soviet to be in the hands of “the Jews.” Bolshevik leaders sometimes came face-to-face with such antisemitism. When walking the streets in early July, Vladimir Bonch-Bruevich — Lenin’s future secretary — encountered a crowd openly calling for anti-Jewish pogroms. Head bowed, he hurried on. More and more reports came in of similar gatherings. At times, class resentment and antisemitic representations of Jewishness overlapped: later in July, speakers at a street-corner rally in Petrograd called on the crowd to “smash the Jews and the bourgeoisie!” Whereas, in the immediate context after the February Revolution, such speeches had failed to have any real traction, they now were drawing large audiences. It was in this context that the First All-Russian Congress of Soviets of Workers’ and Soldiers’ Deputies gathered in Petrograd. This First Congress of Soviets was a historic gathering. More than a thousand delegates from all socialist parties attended, representing hundreds of local soviets and some twenty million Russian citizens. On June 22, as reports flooded in of yet more antisemitic incidents, the Congress produced the Russian socialist movement’s most authoritative statement yet on the question of antisemitism. Drafted by the Bolshevik Evgenii Preobrazhenskii, the resolution was titled “On the Struggle against Antisemitism.” When Preobrazhenskii finished reading it aloud, a Jewish delegate rose to his feet to give it his wholehearted approval, before adding that while it would not bring back Jews murdered in the 1905 pogroms, the resolution would help heal some of the wounds that continued to cause so much pain in the Jewish community. It was passed unanimously by the Congress. The resolution essentially restated the long-held social-democratic view that antisemitism was tantamount to counterrevolution. 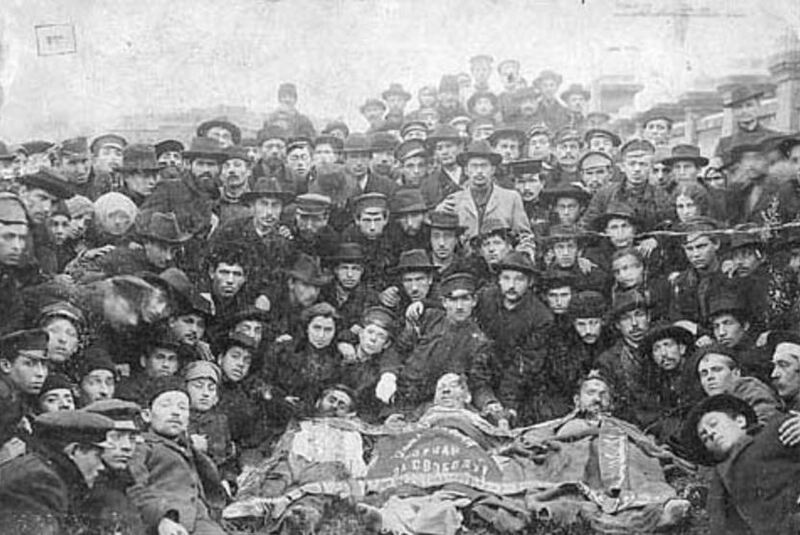 It contained, however an important admission: the “great danger,” read Preobrazhenskii, was “the tendency for antisemitism to disguise itself under radical slogans.” This convergence of revolutionary politics and antisemitism, the resolution continued, represented “an enormous threat to the Jewish people and the whole revolutionary movement, since it threatens to drown the liberation of the people in the blood of our brothers, and cover in disgrace the entire revolutionary movement.” This admission that antisemitism and radical politics could overlap broke new territory for the Russian socialist movement, which until then had tended to frame antisemitism as the preserve of the far right. As the revolutionary process deepened in mid-late 1917, the presence of antisemitism within sections of the working class and revolutionary movement became an increasing problem that required a socialist answer. By late summer, soviets had initiated a broad and wide-ranging campaign against antisemitism. The Moscow soviet, for example, organized lectures and meetings in factories on antisemitism throughout August and September. In the former Pale of Settlement, local soviets were instrumental in preventing the outbreak of pogroms. In Chernigov (Ukraine) in mid-August, Black Hundred accusations that Jews were stocking up bread led to a series of violent anti-Jewish disturbances. Crucially, it took a delegation from the Kiev soviet to organize a group of local troops to put down the unrest. Not so with the soviets. As the political crisis deepened and the process of Bolshevization continued apace, scores of provincial soviets established their own campaigns against antisemitism. In Vitebsk, a city 350 miles west of Moscow, the local soviet formed a military unit in early October to protect the city from pogromists. The following week, the Orel Soviet passed a resolution to take up arms against all forms of antisemitic violence. In the Russian Far East, a meeting of the All-Siberian Soviet issued a resolution against antisemitism, declaring that the local revolutionary army would take “all measures necessary” to prevent any pogroms. This revealed how deeply ingrained the fight against antisemitism was within sections of the organized socialist movement: even in the Far East, where there were comparatively few Jews and even fewer pogroms, local soviets identified with the Jews on the Western Front suffering at the hands of antisemites. It is worth noting, however, that these campaigns against antisemitsm were aimed at workers in factories and sometimes activists within the broad socialist movement. In other words, antisemitism was identified as a problem within the social base of the radical left, and even sections of the revolutionary movement itself. What this revealed, of course, is that antisemitism did not simply emanate from “above,” from the former tsarist establishment; it had an organic base within sections of the working class, and it had to be confronted as such. For the Bolshevik leadership, revolutionary politics weren’t simply incompatible with antisemitism; they were antithetical. As a front-page headline in the main party newspaper Pravda would put it in 1918: “To be against the Jews is to be for the Tsar!” Yet it would be a mistake to take Lenin and Trotsky’s statements on antisemitism and “read off” the thoughts and feelings of the rank-and-file. As the events of 1917 demonstrated, revolution and antisemitism were not always in conflict. Newspaper reports from the summer and autumn of 1917 reveal that local Bolsheviks were frequently accused by other socialists of perpetuating antisemitism and sometimes even harboring antisemites within the party’s social base. For example, according to Georgii Plekhanov’s newspaper Edinstvo, when Mensheviks tried to speak at the Moscow barracks in the Vyborg region of Petrograd in mid-June, soldiers, apparently egged on by Bolsheviks, shouted “Down with them! They’re all Yids!” Plekhanov, we should note, was obsessively anti-Bolshevik by mid-1917, so this source should be treated with caution. Come October, such accusations become more frequent. In the October 29 edition of Evreiskaia Nedelia, an editorial went so far as to claim that antisemitic “Black Hundreds” were “filling up the ranks of the Bolsheviks” across the whole country. The Bolsheviks have seized power. The Jew Kerensky, lackey to the British and the world’s bankers, having brazenly assumed the title of commander-in-chief of the armed forces and having appointed himself Prime Minister of Orthodox Russian Tsardom, will be swept out of the Winter Palace, where he had desecrated the remains of the Peace-Maker Alexander III with his presence. On October 25th, the Bolsheviks united all the regiments who refused to submit to a government composed of Jew bankers, treasonous generals, traitorous land-owners, and thieving merchants. The newspaper was immediately closed down by the Bolsheviks, but the unwelcome support alarmed the party leadership. However, contrary to these alarmist predictions, in the hours and days immediately following the Bolshevik seizure of power, there were no mass pogroms in the Russian interior. Insurrection did not translate into the antisemitic violence that had been predicted. What the warnings cited above reveal is just how deeply ingrained the fear of the “dark masses” was among sections of the socialist left who claimed to speak in their name. This was especially true of the intelligentsia, who generally approached the notion of a proletarian uprising with horror due to the violence and barbarity they believed would inevitably flow as a result. What defined the Bolsheviks during this period was precisely their closeness to the Petrograd masses so greatly feared by the intelligentsia. Yesterday I was standing in line, waiting to vote for the Constituent Assembly. People were saying ‘Whoever’s against the Yids, vote for number 5! [the Bolsheviks]’, ‘Whoever’s for world-wide revolution, vote for number 5!’ The patriarch rode by, sprinkling holy water; everyone removed their hats. A group of soldiers passing by started to belt out the Internationale in his direction. Where am I? Or is this truly hell? Despite Bolshevik insistence on framing it as a purely “counterrevolutionary” phenomenon, antisemitism eluded such neat categorization, and could be found across the political divide, in highly complex and unexpected forms. This would be most sharply revealed six months later, in the spring of 1918, when the first pogroms since the October Revolution broke out in the former Pale of Settlement. In towns and cities of northeast Ukraine such as Glukhov, Bolshevik power was consolidated through anti-Jewish violence on the part of the local cadres of the party and Red Guards. The Bolshevik confrontation with antisemitism in 1918, then, was often a confrontation with the antisemitism of its own social base. Brendan McGeever is lecturer in the sociology of racialization and antisemitism at Birkbeck, University of London. He is the author of the forthcoming The Bolsheviks and Antisemitism in the Russian Revolution .